Canmore’s small-town pride lives on through a busy schedule of festivals and events, which are nearly always accompanied by parades of flag-waving kids, free downtown pancake breakfasts, and an evening shindig somewhere in town. 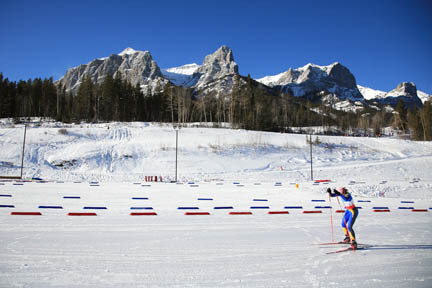 A racer comes up to the finish line at a World Cup event hosted by the Canmore Nordic Centre. Throughout the winter months, locals play hockey on ponds and rinks scattered throughout the valley. Things get a little more serious at home games of the Canmore Eagles (www.canmoreeagles.com), held at the recreation centre along8th Avenue. The New Year is ushered in with Party on the Pond, with skating, wagon rides, fireworks, and bonfires on and around the frozen pond beside 10th Street. Meanwhile, the Canmore Nordic Centre hosts a variety of cross-country and biathlon races through winter. The mid-June celebration artsPeak Arts Festival (403/678-6436, www.artspeakcanmore.com) is hosted at venues throughout town, including along the main street. As the name suggests, expect lots of arts-oriented festivities, including workshops, displays, and walking tours. Canada Day (July 1) is celebrated with a pancake breakfast, parade, various activities in Centennial Park, and 10:30 p.m. fireworks. Canmore Nordic Centre hosts a variety of mountain-biking events each summer, highlighted by a stop on the 24 Hours of Adrenalin tour (416/391-2651, www.24hoursofadrenalin.com), in which 1,500 racers complete as many laps as they can in a 24-hour period, either in teams or as solo riders. For a full listing of mountain-bike races, contact the Nordic center (403/678-2400). On the Heritage Day long weekend, the first weekend of August, Canmore hosts a Folk Music Festival (www.canmorefolkfestival.com), which starts on Saturday and runs through Monday evening. This event, which attracts more than 14,000 fans, features national and international acts performing in Centennial Park, musical workshops, and a free pancake breakfast beside the post office on Heritage Day. The first Sunday of September is the Canmore Highland Games (403/678-9454, www.canmorehighlandgames.ca), a day of dancing, eating, and caber tossing culminating in a spectacular and noisy parade of pipe bands throughout the grounds of Centennial Park; the event attracts more than 10,000 spectators. The grand finale is the <@I>ceilidh, a traditional Scottish celebration involving loud beer-drinking, foot-stomping music, which takes place under a massive tent set up in the park for the occasion. Fall’s major gathering is for the Festival of the Eagles (www.eaglewatch.ca) on the middle weekend of October and coinciding with the southbound migration of golden eagles. Viewing scopes are set up at the high school grounds off 17th Street while scheduled events include talks, slide shows, and field trips.